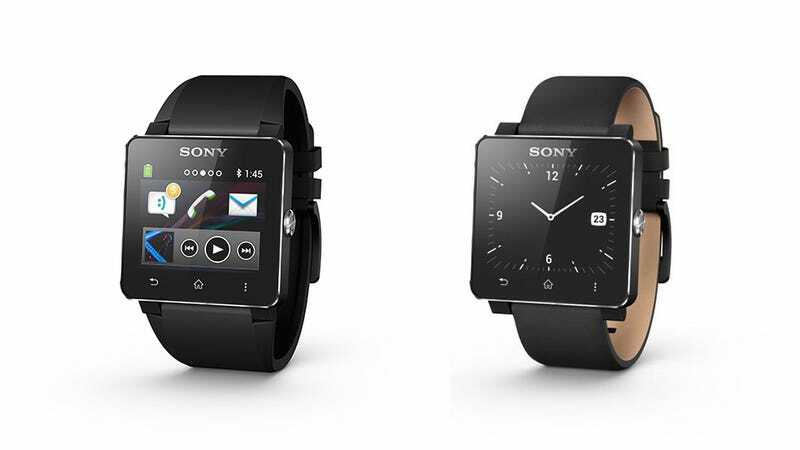 We really wanted to love Sony's SmartWatch last year, but we couldn't. Which is to say, it made us want to bite our own arms off. Sony is back at it again, though, and thankfully the sequel looks like a real improvement over the previous generation. For starters, the SmartWatch 2 has a bigger screen and higher resolution (1.6 inch, 220 x 176 pixels) and claims to have greater brightness than the previous version, so you can more easily read it in sunlight. It has a longer-lasting battery and it's water-resistant (IP57). We found last year's model to be a pain to pair with your phone, but this year's model has NFC, which generally makes linking your gadgets as simple as tapping them together. The UI has been reworked to make it more similar to Android, which will hopefully me more intuitive, and, unlike last year's, it can actually continue to do things (like read downloaded emails) even when disconnected with your phone. From the photos above, it's actually pretty attractive. It has an aluminum body and comes with a stainless-steel wristband. The watchband can be swapped out for any standard 24 millimeter wristband, which leaves your styling options very open. It will also work with a wider range of Android phones than the previous model. The SmartWatch 2 will ship globally in September of this year. No word on price yet, but last year's model launched at $150, to give you some idea. Here's hoping these improvements add up to make a real difference.